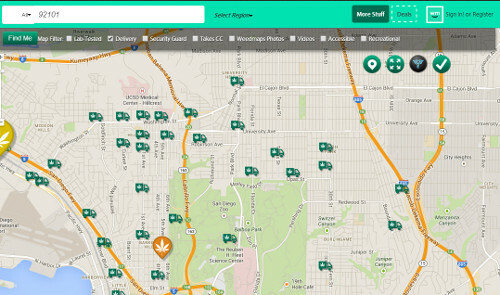 This screen capture from weedmaps.com shows some of the mobile medical marijuana clinics operating in the 92101 ZIP Code. Delivery or mobile medical marijuana providers in the city far outnumber storefronts. Now that San Diego is regulating storefront medical marijuana clinics, the City Council is moving its attention to mobile dispensaries. Medical marijuana delivery services are not permitted. However, the marijuana dispensary locator website Weedmaps.com shows delivery or mobile medical marijuana providers in the city far outnumber storefronts. Lynda Pfiefer, representative of San Diego's Development Services department, said the city's current regulations don't permit mobile dispensaries or delivery services in any zone, which makes enforcement of the delivery laws similar to those for unpermitted storefronts. "If we were made aware of a fixed location within the city of San Diego from which a marijuana mobile/delivery use was being conducted, we would investigate and enforce, as appropriate," Pfeifer wrote in an email. The website Weedmaps.com shows a delivery truck icon with an identifying pop-up noting many provide only deliveries; most have no addresses. However, the location on the map doesn’t always correspond to the limited identifying information. New Day Delivery — Bankers Hill service, for example, has an icon over western Bankers Hill on the map, but the pop-up notation says "Barrio Logan, CA 92113." The City Council's Committee on Public Safety and Livable Neighborhoods will discuss regulations July 16, its second meeting on the issue. At the first discussion in April, Councilwoman Myrtle Cole proposed that drivers making deliveries to patients’ homes from a dispensary possess a county-issued medical marijuana identification card and documentation "that they are making a delivery from a permitted cooperative storefront." The motion also proposes that deliveries originate from the storefront and be labeled for a specific person. Cole's draft motion was prepared with comment from members of the committee, led by Councilwoman Marti Emerald. Tim Taylor, Emerald’s chief policy adviser, said the plan is to consider amendments to one ordinance -- generically called the Public Safety Ordinance -- that covers all operations for medical marijuana. "A lot of discussion was on edibles and their safety, and concentrates and their safety and what, if anything, can be done to protect consumers," Taylor said of the discussion in April. "I can't speak for the police for how they're going to treat the people that they stop," Taylor said. "The idea is that deliveries would have to be made by somebody that's holding a card," and that the delivery would be from a permitted storefront dispensary. That current regulations require people transporting medical marijuana to follow state law leaves the regulation of deliveries open to interpretation. "It doesn't talk about the transactions, per se, no," Taylor said. Emerald, he said, wants to see the delivery services regulated, and supports the committee’s motion. Michael Giorgino, spokesman for the San Diego City Attorney's Office, said the regulations adopted this year address only land use, and that other than the dispensaries allowed by the new regulations, all marijuana dispensaries remain illegal under the city’s zoning laws. Cole's motion would fill in some gaps to apply to medical marijuana delivery services. If adopted, the proposal could direct the city attorney to draft changes to Chapter 4 of the San Diego Municipal Code, which covers health and sanitation. In addition to the labeling requirements for deliveries, the motion proposes making city-initiated background checks mandatory on people responsible for medical marijuana collectives. Taylor said there is no deadline for the committee to complete its work or for the full council to take up the issue.